As you've recently been reading on this blog, autumn is the neglected season of phenology research. Recognizing this issue, a few members of the Primack lab family (Richard, Amanda and Libby) and our good friend and colleague at the Manomet Center for Conservation Science, Trevor Lloyd-Evans, wondered if and how the timing of autumn bird migration was changing in Massachusetts. We were curious how the longer growing season, delayed leaf senescence in trees, and increased availability of insect food sources that can accompany warmer weather would impact birds' migration to southern wintering grounds. To explore this, we used data of 37 bird species from the Manomet bird banding program between August and November from 1969-2012. 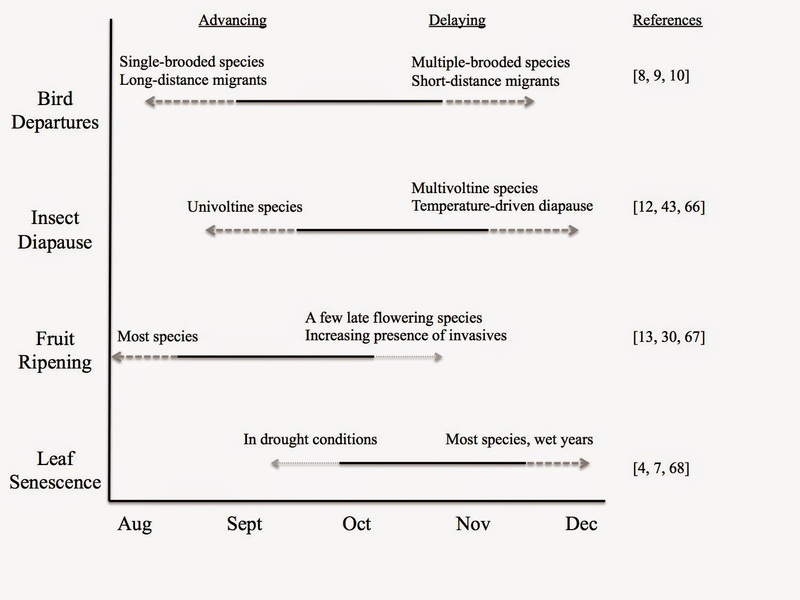 We found that 14 species have migration dates correlated with temperature: 13 are migrating later with warmer temperature and one, the gray catbird, migrates earlier with warmer temperature, as you can see in the figure below. 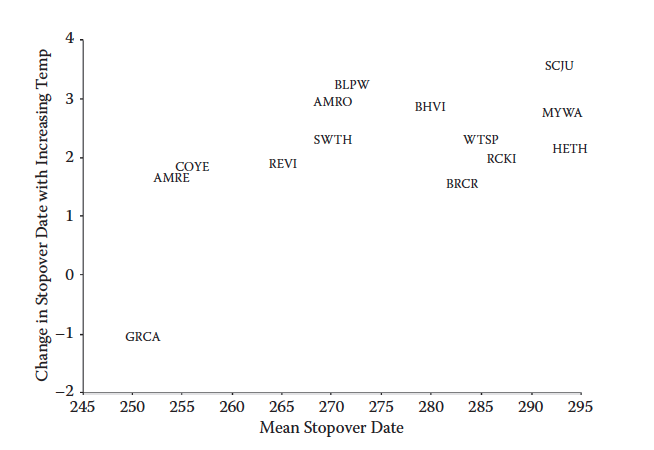 The relationship between mean stopover dates and changes in stopover date with August + September temperature for species demonstrating significant changes in stopover with temperature. The x-axis represents the mean stopover date of the species over all years, and the y-axis represents the slope of stopover date and temperature, days °C–1. Species abbreviations are standardized codes: BHVI (Blue-headed Vireo), REVI (Red-eyed Vireo), BRCR (Brown Creeper), RCKI (Ruby-crowned Kinglet), SWTH (Swainson’s Thrush), HETH (Hermit Thrush), AMRO (American Robin), GRCA (Gray Catbird), COYE (Common Yellowthroat), AMRE (American Redstart), BLPW (Blackpoll Warbler), MYWA (Myrtle Warbler), WTSP (White-throated Sparrow), and SCJU (Slate-colored Junco). All in all, autumn bird migrations are quite variable and species are responding in different ways to a changing climate. Further, it appears that some bird species may respond differently to autumn environmental cues than plants and insects, which has implications for the success of individual species and the ecosystem as a whole. Read more about this study here. Most of the research on how climate change affects phenology has focused on spring. Unfortunately, this has left the autumn season comparatively neglected in climate change research! This neglect is likely because autumn events including leaf senescence, fruit ripening, insect diapause, and autumn bird migration, are often less sudden and visually apparent than their spring counterparts, and autumn events are driven by more complex environmental factors. Our recent review, published in Trends in Ecology and Evolution, aims to bring autumn into the spotlight by digesting the existing research on the effects of climate change on autumn phenomena and by providing recommendations for the future of autumn research. In this review, we identify five key topics that are ripe for research in the field of autumn phenology: 1) The drivers of autumn phenology, 2) The methods used to study autumn phenology, 3) The influence of autumn on carbon storage, 4) Invasive species, pests, and pathogens in autumn, and 5) Interspecies interactions. Through our exploration of these topics, we find that changes in autumn phenology alter the reproductive capacity of individuals, exacerbate invasions, allow pathogen amplification and higher disease transmission rates, reshuffle natural enemy-prey dynamics, shift the ecological dynamics among interacting species, and affect the net productivity of ecosystems. Figure 1. The expected effects of climate change on the timing of leaf senescence, fruit ripening, insect diapause, and bird migration in the temperate ecosystems of Eastern North America, based on the published literature. Gray broken lines indicate the direction in which an event will shift; darker stippling indicates a response that is common, while lighter stippling indicates a response that is comparatively rare. By identifying the challenges of monitoring autumn events compared to spring, we provide recommendations to address common pitfalls in autumnal research. We also identify groups that are likely to be especially vulnerable to species invasions and ecological mismatch as autumn climate continues to change. As these findings shape the emerging research here in the Primack Lab, we hope that other researchers will also find this synthesis beneficial for their future work on autumn phenology and climate change.